Organizing in its best sense—helping people work together to achieve what they want—is at the root of union democracy. You’re not asking co-workers to join a social club or an insurance plan. You’re asking them to join a fight over issues that matter. To scale up and tackle big goals takes time and planning. A good campaign starts small and builds. You’ll need a system to track members and potential members, with maps and lists. Get to know the informal leaders in the workplace. To succeed, your organizing has to combine action on the job with a fight for justice in the wider society. Even if the open shop hasn’t hit your union yet, don't get too comfortable. 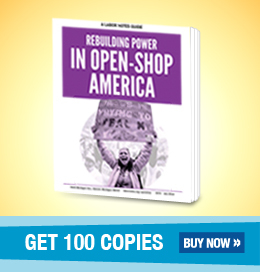 The open-shop offensive is part of a multipronged plan to ‘defund and defang’ the labor movement. Opt-out canvassers may show up on your doorstep next. “Right-to-work” laws originated in the 1940s as a strategy to maintain Jim Crow in the South.